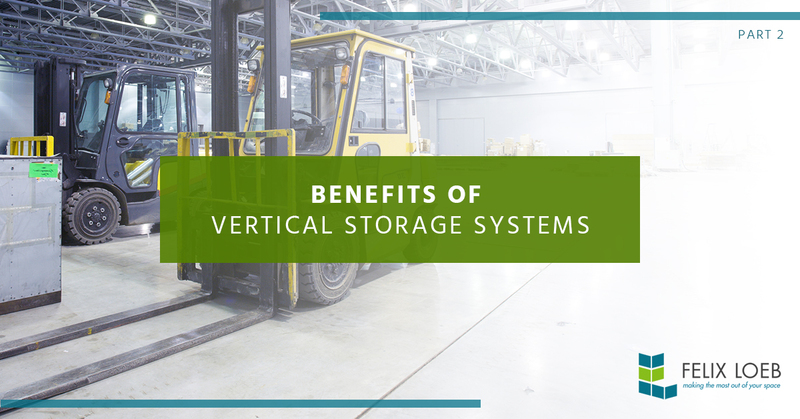 In our last blog, post we began discussing the benefits of vertical storage and how it really is essential for the success of your Chicago-based business to invest in vertical storage systems. The two benefits we discussed in our last blog are space economy and efficiency. Vertical storage in most cases is the best way to utilize the space in your backroom or warehouse because most spaces have a seemingly unlimited available vertical space versus that which is offered horizontally. Vertical storage solutions allow you to run your business more efficiently, spending less time looking for the products and tools that you need. Vertical storage systems also allows you to better care for your products. Often what hurts businesses the most are financial losses due to lost or damaged products. Vertical storage and organization gets products off the floor, stored properly, providing less of a chance of loss and damage to your goods. Say goodbye to losses when you employ vertical storage solutions such as wire racks, bins, and other systems. When vertical storage systems are setup correctly and are not overloaded, they can actually promote operator safety, and really the safety of all who frequent your backroom. Once again, products and tools are off the floor which if left on the floor could become tripping hazards. Also, employees are protected because they will not be subjected to lifting and stacking heavy boxes. Using forklifts and other safe lifting mechanisms promote the safety of all who work in your backroom. We hope you’ve enjoyed this short blog series about the benefits of vertical storage systems. If you are interested in employing them for your Chicagoland business contact Felix Loeb! We provide high quality storage products and services and would love to partner with you for your businesses success. Visit our website to learn more about us and the products and services we can provide. Also, contact us for a free project quote!